Spring is in the air right now- winter may finally be over. And that means the end of the spring semester at college. Unfortunately, that means extra work, as grading adds all kinds of things that have to be done on a deadline. At my university, I have two sections of Intro going right now, 34 students total, and just 2 weeks to go. That means just two more meetings, just two more long days, long early morning drives. I like that part. But it also means a lot has to get done in those two weeks. For example, I devoted part of today to grading the recent 2D final, and shared information with students regarding the current 3D final, and trying to get some to finally turn in their research assignments, which I hope to all have graded by this Friday. But my biggest task today was working on a student art exercise, their collagraph project. I always try to have at least one print project in every studio class I teach, and with the Intro class that takes the form of a collagraph. I have the materials, it's not too difficult for inexperienced students, and results are not too bad. Plates were made in class a while back, and I brought ink and tools to class a few weeks ago so students could get them printed during class. Of course, students being students, some had not completed their plates, some had forgotten them, some didn't show up...you get the idea. But prints are important to me, and it's the one thing they really can't finish on their own, so if they can get me the plate by a certain point, I'll just take them to my Studio and print them there. More efficient than bringing all the printing stuff each week. So today I had 7 such prints to take care of. Above is a photo of the resulting prints. The students will have the option of adding color to the dry prints (used water based ink, so they will be dry when they get them back), but even in this form they have their charms. This usually ends up being one of the things they do and actually choose to save at the end of the semester. And I had at least one student last week who asked me for more of the material we used to make the plates, so maybe I'll get more of these to do this coming week. If they don't get them to me by then, they are on their own. Got a call from the Belmar Arts Council today with some news that I already knew, but I guess now everyone knows. 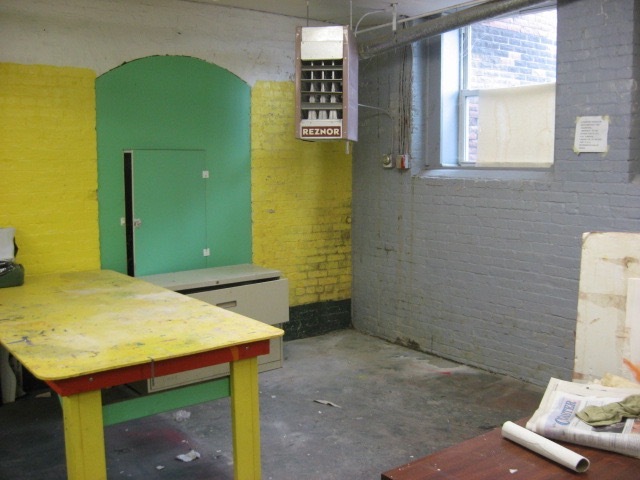 Last year various trustees and other people who run the BAC had asked me about the possibility of doing a printmaking theme show there. Maybe it was because of my successful woodcut class there last summer. I had expressed doubts, as there just aren't that many people doing printmaking, especially in this area. But then one of my former Belmar print students approached me with something she had cooked up with an old friend she had reconnected with at a college reunion. 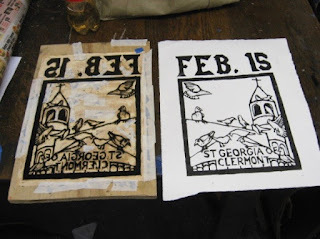 Part of that new connection was that both were doing a lot of printmaking, and my student had even been invited to go out west to Portland and hand pull some very large woodcuts. 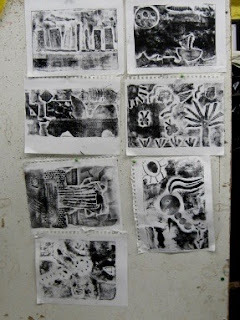 (my class is very old school) Their idea was a print show pairing traditional printmakers from the east and west coasts. Where could they show such a thing? So I suggested Belmar, and I got a good response to the concept, and had Mary put together a proposal. More good response, so it moved forward. She got a date for the show and I started helping her navigate the policies and rules for such things. Then the trouble began. Big turnover of authority there in Belmar, and the new faces either lacked an interest or experience. Feet were dragged for weeks. Policies and rules were piled on. Two coasts worth of organizers were not satisfied. Mary asked me if it would be okay if she sought another location for the show. Told her it was her show and she didn't need my permission. She started looking for other options and about 2 weeks ago she informed Belmar of her desire to pull the show out of there. She took a meeting with a new location, but I'm not going to say more about that until it is official. But now BelmarArts has told me that they discussed her request to end the show and have agreed to go ahead with that, including giving back a donation for that show that she had secured. What remains now is for them to decide what they want to do with the exhibition slot. Another print show? Something completely different? I'm not going to worry about it until they ask me about it. A few days ago I learned that this Sunday they will be celebrating the birthday of my niece Georgia, the one I did the mermaid for a while back. Even before I made the mermaid, I had done the traditional thing I had made for her siblings. a saint print of a saint he shares her name with. I made a prototype, but hadn't gotten around to making a copy to hang along side the previous ones, mostly because I couldn't find the block, completed last summer. I thought the print successful, and it received many compliments when people had seen it, and I figured when I started gathering things for the new print class, I would finally find the block. And I did. Had a lot of other things to deal with over the past few weeks, and still do, but I had time for a Studio visit today and went there this morning to take care of business. Nothing like rolling out some ink and getting to work. I had a can of black ink in progress, and one new one, but wanted to save the latter in case I needed it tonight. The older can was mostly dried up, but I was able to extract enough ink to pull a proof. Below are the results. Proved to be tricky, between the bits of skin in the ink and lots of stray marks from the block. Not a great proof in itself, and if just the black and white probably not usable, but the watercolor may be enough to save it. Had to use a lot of masking tape to cover the stray marks, so after it dries, I may attack the block with woodcut tools and cut away some of that offending wood. Meanwhile, I left the print to dry at the Studio. 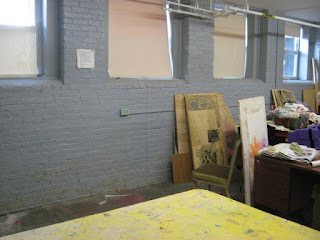 No things I had to do during the day today, so it was a good day for a Studio visit. Had two things to do there- talk to the new director about some show related stuff, and to start drawing the latest block. The print is one I was planning for the East Meets West show, and whatever happens with that it's still months away, but this can also help me with my Belmar woodcut class, which will resume next week. Week 2 of that class is when they start cutting, which I will demonstrate early on. Normally I just cut random shapes in a piece of scrap wood, but I think it would be more exciting for them to see an actual block being carved. Of all the blocks that I'm planning for the near future, this was the one that would be easiest to draw. The block design is very much like the one I worked out in the waiting room of the car repair shop back in February. In the center is a wheel, which I think was mentioned in the television report, a symbol of a man's promise to work to support the woman he gives a wooden spoon to. I had considered basing it on the design of the wheels and hubcaps on my own car, but in the end I figured a wooden wheel made more sense, so this one was based on a covered wagon wheel. (every day my television brings me dozens of vintage tv westerns, so finding a source was no problem) Wooden spoons are a major part of the Welsh custom in this case, but they are also significant to my own process of printing. Combining the playing card format and the romantic holiday associations, opposite corners will have small red hearts, accompanied by the common feast day date. Horizontal above and below the wheel will be drawings of wood carving tools, significant to the traditional custom of carving a wooden spoon to give to the woman one loves. I will be carving spoons, but only as relief, not in the round. I just started on the carving tools when I had to call time and make a stop at the store to pick up ingredients for a batch of meat sauce. 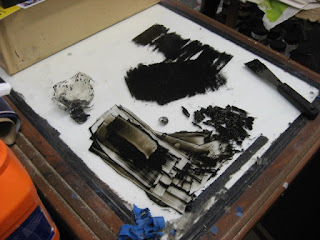 No problem- the woodcut demo will be next Tuesday, so plenty of time to finish the sketch before then. My latest Belmar woodcut workshop started tonight. (the above photo is from a class taught at a college a few years ago, but the activity and effect was about the same as tonight) I had gotten confirmation last week that the class was going to run, with my minimum of three paid students signed up. I bought wood last week, and a good bit of today was spent gathering materials for my traditional first night. I brought several exchange folios (what you see above), some examples of my own prints, books by favorite prints artists, plus tools, blocks, and other things to show them how we'll be working in the coming weeks. Only two of the three registered students showed up, so perhaps I'll eventually hear from the missing guy. One of those present said she had been interested in this class for a long time, but this was the first time that money and her schedule allowed her to take it. Those present seemed to be impressed with what they saw and they walked out with nice clean birch blocks at the end of the class. 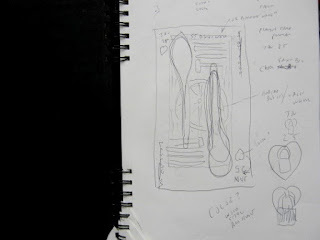 I encouraged them to come up with drawings before we meet again in 2 weeks, on paper if not on the wood itself. It took me a good half hour to pack up all my stuff and clean the room, and another half hour to drive home and unload my car. As I expected, in the process of gathering stuff to show the students tonight I uncovered my St Georgia woodblock, which I figured I last had to show last year's woodcut students. So in the near future I can finally produce the final version of that for my niece. 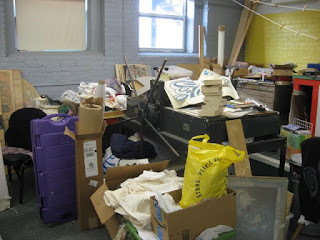 A few weeks ago, I got a call from Molly telling me that Jackie had informed her of a plan to move out of our Studio. I've known Jackie for many years, first from a gallery and studio space she had on Cookman Avenue in Asbury, where she had exhibitions of her own works and other people. A few years ago that place closed, I don't know if it was her decision or she was pushed to do it. At some point she started working in a store in Ocean Grove (I think while she still had her space, too) and Molly had produced product to sell there for years, silk screened t-shirts and stuff. I was told that Jackie was working on art out of her garage, but that was awfully cold in winter, so Molly offered to split our rent with her and invited her to join us. A blog entry from that time can be seen here. Molly always claimed she never gave her permission to take up as much space as she did, but three years later, she was still around. My friend Jenny even met her in her store up the street, and believes she bought one of Molly's shirts there. But I was told that job ended. Jackie was able to find a replacement job, and this place is even giving her a nice work space, so she's relocating to there. She started packing up her stuff (she had a lot of things in her corner) last week, but today it's mostly gone. A few things are left (that brown wooden desk wasn't part of our space), but I'm guessing she'll come get them soon. What happens next is yet to be decided. Molly asked me if I wanted to seek a new third person to split the rent, or to just go back to being the two of us. There are advantages to both options, so I told her I was okay with either, just wanting approval of anyone coming in, and advising that she establish up front the space, since she still claims she never wanted to let Jackie have all that space (but as lease holder, she had the power to stop her, but didn't). In our last conversation, Molly was leaning toward just keeping it the two of us, as it was for several years. I guess we'll see what happens in the future. Now that the mermaid sculpture and its prints are finished, definitely time to move on to something else. 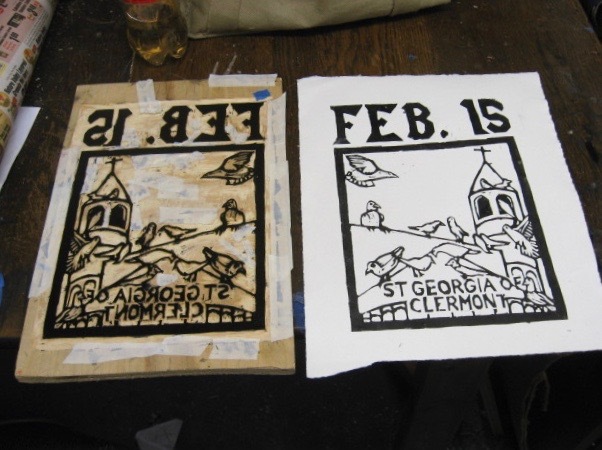 Plus, I have a woodcut class coming up real soon in Belmar, someone asking to visit the Studio and see the process, and I like to keep busy with the art. 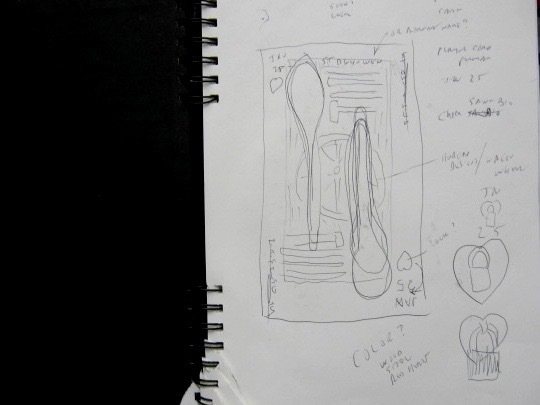 I have firm ideas for 3 prints, and two have been started to some extent. Decided the one to work on today would be St Dwynwen, which I wrote about back in February. 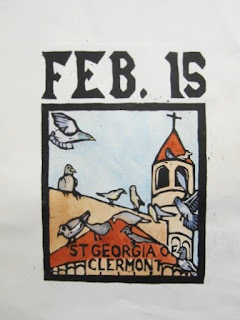 Although this piece is a saint, it's not part of my Everyman series, mostly for two reasons. First, it's not in the Butler's books that are the origin of that series, and second, it's not clear if she is actually a saint, as neither the Catholic Church, or the Anglican Church (which dominates the part of the world that she was from) acknowledges her. Right now there's mostly just a decayed abandoned church building in Wales and a lot of legends. Butler's casts doubt on the stories of quite a few saints in the biographies, but at least it lists them. However, the story I have pieced together is hard to resist. Not so much for the saint, but for the customs of the holidays, which involve carved wood and wooden spoons, both part of my print process. The above sketch was done weeks ago in the waiting room of my auto repair shop, as I was getting a repair done. Since this isn't a part of my Everyman series, I don't want to use that standard format of those. What I came up with that day was something reminiscent of a standard playing card. Maybe it was the plan to use heart shapes that made me think of it. It will be a vertical design, more or less the same whichever end is up. In this early version, long wooden spoons point up and down, there's a wheel in the center (a common symbolic thing in art of this tradition), and typical woodcarving tools. horizontal and filling the space. It will be hand colored, but color patterns will be simple. Right now the plan is to make this for my contribution to the East Meets West print show, but it could be part of other shows as well. 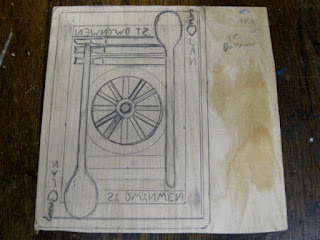 I found a medium-small piece of birch plywood, on which I started laying out a 10" x 7" design, based on the above sketch. Didn't get too far today, since I had other things to do, the show it's intended for is several months away, and I could see from the sky that a big storm was heading our way. Brought the block home to work on if I have time. Last night was the Championship Game, the conclusion of the annual NCAA Men's Basketball Tournament. Which means it was also the conclusion of my annual Art tournament. Result was about what I expected. When I filled out my bracket a few weeks ago, going game by game until I reached the end, I found that I had selected Villanova to be this year's basketball champion. I'm guessing many people agreed with me. They were ranked #1 for most of the season, no worse than #3 the rest of the time, and were at the top of their conference most of the year. Had a few students left from their national championship team of a few years ago. Their conference (The Big East) is a dominant one in this area, so I had seen a few televised games this season, and I knew what they were capable of doing in a game. Thus I still had one of my art teams in the final game. And it played out. A lot of 20 point wins in recent weeks, and most of those against big midwestern schools, so I'm guessing they were not intimidated by last night's opponent, Michigan. It was a fairly intense game, close early on, but in the 2nd half, Villanova took the lead for good, and gradually expanded it, getting to that 20 point margin with a few minutes left. Is it because they were smart enough to host a group show that included a few pieces of my art back in 1997? Probably not, but if more schools thought so, I'd likely have more shows. The news today showed that the Philadelphia reacted much the same way that they did following this year's Super Bowl, making me glad I live at the Jersey Shore instead.